. Nakasendo 中山道 - Kiso Kaido 木曾街道 . This postat station is situated at the entrance to Kasatori Pass. Now part of the of Tateshina, in the Kitasaku District of Nagano Prefecture. Ashida-shuku was formed in 1601, during the Edo period, when the Nakasendō's route was altered and the government ordered creation of new post towns. It was located near the eastern entrance to the Kasadori Pass and was well known for its silk production. "Nyogetsuni is the Buddhist name of the former nun who becomes the sorceress Takiyasha (the name used by Kuniyoshi on the title page) in the 1806 novel The Loyalty of Utō Yasukata (Utō Yasukata chūgiden), written by Santō Kyōden and illustrated by Kuniyoshi's teacher, Toyokuni. The book was very popular and became the basis for a number of puppet plays and kabuki plays, as well as a later sequel by another author. 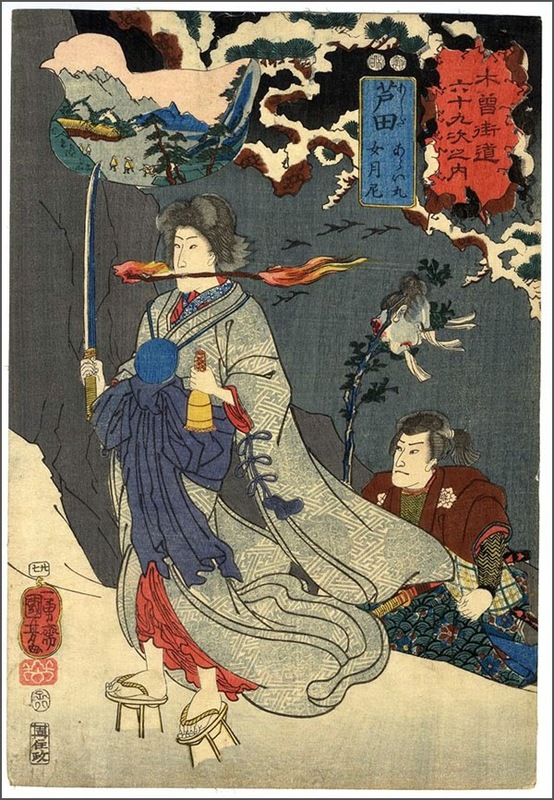 In Kyōden's fantasy novel, Takiyasha and her brother, Yoshikado, are the children of the historical warrior Taira Masakado, who rebelled against imperial rule in the tenth century. After their father's death, the brother and sister learn toad magic from an immortal in the mountains in order to carry on the rebellion. Their headquarters is the ruined palace at Sōma, a place-name that could mean 'herd of horses,' and so horses are featured in the series title border. The name Ashida station is a pun on the word for 'clogs' (ashida, also called geta), and Takiyasha wears high clogs to walk through the snow as she performs a magical ritual, with a torch between her teeth, a mirror around her neck, a bell in her left hand, and a sword in her right. Her hair is still relatively short, a reminder of her recent past as a Buddhist nun. Takiyasha is followed by her henchman, Araimaru, who carries the head of one of their victims attached to a branch. The bird shape of the outlines the inset landscape represents a seabird of northern Japan known as utō or utōyasukata, the source of the name of the character mentioned in the title of the book. Utō Yasukata is killed by the evil magic of Takiyasha and Yoshikado, but his relatives and their friends are eventually able to avenge him and defeat the sorcerous siblings. Kuniyoshi designed a number of prints based on this story, including the famous triptych in which Takiyasha uses her magic to summon the evil spirit in the form of a giant skeleton." The sorceress Takiyasha, formerly the Buddhist nun Nyogetsuni (Nyogetsu-Ni, Jogetsu-Ni), walking through the snow as she performs a magic ritual. The daughter of the slain warrior Taira no Masakado, she and her brother Araimaru have vowed to carry on his rebellion and avenge his death. She grips a sword upright in one hand and carries a bell in the other, a flaming torch held between her teeth. 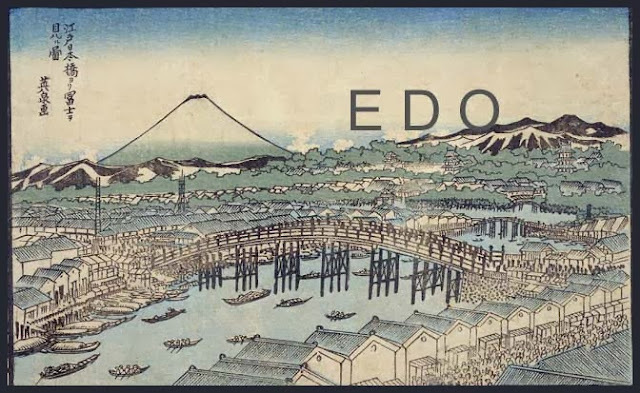 The Kisokaido Road was an inland route connecting Edo with Kyoto. There were sixty-nine rest stops along the Kisokaido Road. 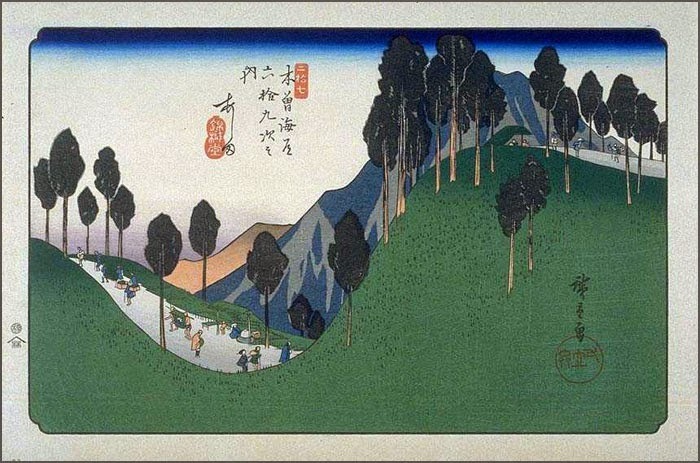 In this series, Kuniyoshi designed one print for each of the sixty-nine rest stops. the main design of each print portrays a historical, legendary or fictional scene associated with the location. 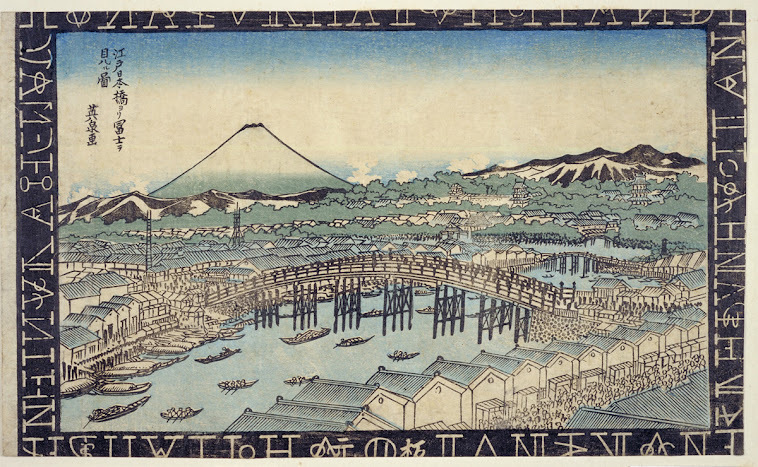 A small panel in each print shows a view of the station.
. 平将門（平將門) Taira no Masakado .
. Utagawa Kuniyoshi 歌川国芳 . ...one of the most powerful onmyoji from Abe no Seimei's era. He was the rival of Abe no Seimei and fought him nearly a thousand years ago.